Yesterday we celebrated my second child’s 3rd birthday. He choose his favorite dinner to eat — pasta with sausage and a salad. 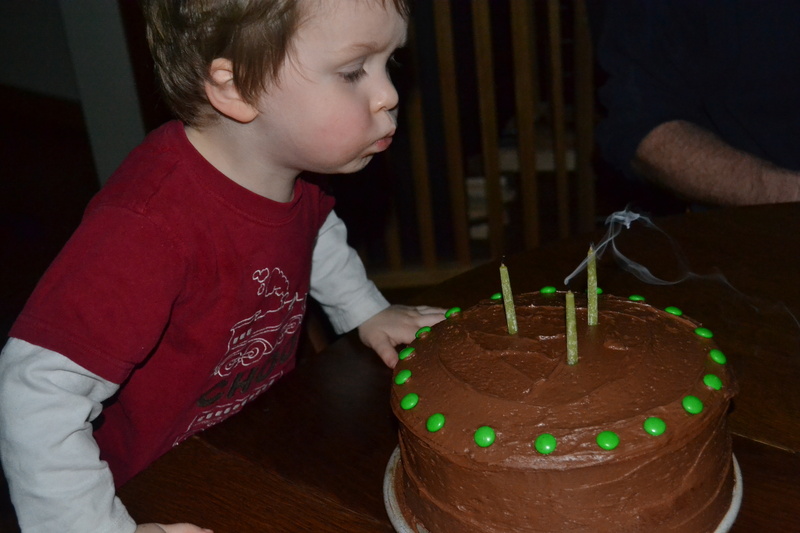 We made a yellow cake with chocolate frosting and green m&ms (his favorite color and his only request this birthday.) He opened a couple presents, but his older brother was much more interested in what he got. The birthday boy was just happy to be having his birthday… and eating green m&ms. I can feel how each year the birth story of my child fades a little more into my subconscious. I remember my first son’s first birthday. I relived each moment of my birthing experience in real time — It’s 7am. I just had my first contraction. It’s 5:30pm. My midwife arrives. It’s 10:00pm. I’m starting to push. It’s 2:00am. The baby goes into distress and we are transferring to the hospital. It’s 4:30am. My baby is born by cesarean. It’s 8:30am. I hold my baby for the first time. And it’s not just these moments. But, all the moments in between. The next birthday I had the added layer of the happy memories of my child’s first birthday. And the pain and challenges from my c-section birth started to transform and I could just begin to see the gifts that came from the experience. By then I was expecting my second child — this little boy who just turned 3 years old. I remember thinking when I was pregnant with my first child how nice it would be the second time because I would be able to be more relaxed and enjoy it more. But, when I got pregnant, I entered the new and more complicated world of Vaginal Birth After Cesarean (VBAC) preparation. In those early days of pregnancy as I tried to find my options and choose a provider, I felt an incredible amount of fear, distrust and lack of control. My options seemingly kept narrowing and narrowing. But, luckily, I had discovered a strong and supportive community with International Cesarean Awareness Network (ICAN) and was active on the local email list. It was through ICAN that I first heard the phrase Empowered Birth After Cesarean (EBAC) — the belief that a mother can make informed decisions throughout the pregnancy and birth process, that birth is a transformative event for both the mother and child and that every birth is different. I had to recognize that there was no guarantee that I would have a vaginal birth, but I knew I wanted to be surrounded and cared for throughout my pregnancy and birth by birthing professionals who understood and valued my fears, listened and adjusted to my needs and, ultimately, trusted that I could have a vaginal birth. I choose a midwife who had a lot of experience with VBAC mothers and was willing for me to give birth at her home based birth center in Seattle near two hospitals. I choose a doula, Sharon Muza, who offered me support during my pregnancy and birth. My husband, Mark, and I took her amazing VBAC preparation class that offered us a new level of trust in our decision to have our baby naturally. I read books and blogs, listened to meditative tapes, exercised, did acupuncture, had massage, went to an ICAN meeting, journaled, broke down and cried and then found my strength and excitement again. My due date came and went and I began to feel like I could be pregnant forever. But, just two nights later, at 8:45pm, I had just finished making a batch of chocolate chip cookies and was setting up a video to watch with my husband, when I felt a contraction. Things progressed quickly and before we could leave for Seattle I was already feeling pushy. It was decided that my birth team would come to us. My midwife and her team arrived at 11pm and my doula arrived at 11:30pm. There were times I would begin to cry after pushing, not believing that this time would be different, wondering when I would be told that it was time to transfer. But, then I would hear words of encouragement whispered in my ear and look up to see faces full of kindness and complete trust in me and my body. Just an hour after my midwife arrived, I pushed my second child into the world. I could hardly believe it was possible to hold my baby just moments after he was born. I held him and sat on the bed, staring at my husband in disbelief of what had occurred. Someone asked if it was a boy or girl, so I pulled back the blanket wrapped around him. Two brothers! How wonderful! He was born with his eyes closed, seemingly asleep, but finally opened them and let out a little cry. I nursed him when he was just 20 minutes old. Then, my husband cut the cord and got to hold him for the first time. It was so sweet to see. Our birth team attended to us, Sharon made everyone grilled cheese sandwiches and apple slices, and we ate the cookies I had just made before labor started. Then, everyone left around 3am. My husband and I just stared at one another. We could not believe what had happened. We cuddled up and slept (all of us) until my older son woke up and met his brother for the first time. It was my journey through this pregnancy that empowered me. The birth was the blessing. Thank you for your sweet comment. I am just now seeing it but it is always a gift to know that others are reading my posts. It is a gift to connect with other mothers in this way. I love your story. Thank you so much for sharing it.